A crack terrorist squad led by a guy named Kang (Rick Yune) takes over the White House and captures the President (Aaron Eckhart) along with key members of his cabinet. With all the secret service agents dead and no way for the military to get to the terrorists and their hostages, America's only hope is former secret service agent Mike Banning (The King of Sparta himself, Gerard Butler), sole survivor of the initial assault. All he has to do is take out the roaming red shirt terrorists patrolling the halls of 1600 Pennsylvania Avenue, get the President's son (Finley Jacobsen) out before the terrorists catch him, act as eyes and ears for the acting President (Morgan Freeman), and somehow get into an impregnable fortress and rescue the Commander in Chief. 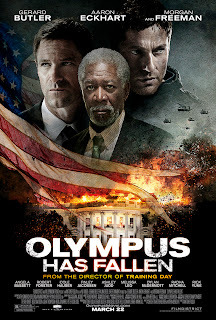 OLYMPUS HAS FALLEN is more or less a blend of INVASION USA (or RED DAWN, if you prefer) with DIE HARD. The script is exactly the kind of ridiculous, jingoistic Cheez-Whiz you'd expect from an eighties Cannon film, but director Antoine Fuqua directs it with enough flair, and treats the material with such an almost convincing air of seriousness, that most viewers probably won't notice or care. The cast is also far better than one might expect for such 'B' movie material. Butler gets a chance to be a first rate action hero again after following up his star-making role in 300 with too many forgettable films, and Yune provides just the right counterpoint with the kind of charismatic villainy that can really get an audience rooting for a character's death. Aside from the already mentioned Freeman and Echkart, the supporting cast also includes such notables as Dylan McDermott, Angela Bassett, Melissa Leo, Ashley Judd, and Robert Forster. I'm not sure if OLYMPUS beats the Joe Bob Briggs “Drive-In body count record” of 185 previously held by INVASION USA, but it has to at least come close. Yes, it's gratuitously violent. Yes, it's stupid. Yes, it's flag-waving propaganda. Those aspects of the film will no doubt upset all the usual folks who complain about cinematic violence and right wing fantasies. Those capable of discerning the difference between movies and reality and who find the occasional violent right wing fantasy entertaining (even if they happen to lean more to the left, as this writer does) should have no such problems. Where Schwarzenegger, Stallone and Willis fell short of delivering what action fans wanted in their recent comeback efforts, OLYMPUS succeeds. 3 out of 4 stars.